2 Department of Plant Pathology, University of California-Davis, Kearney Agricultural Research and Extension Center, Parlier 93648, California, USA. 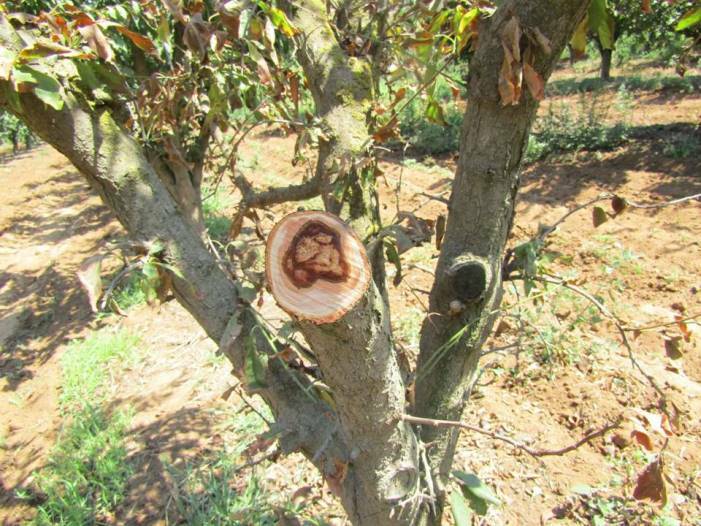 In late summer 2017, a serious decline and dieback of plum trees was observed in many orchards in Tunisia. Black Star and Sun Gold were the varieties most affected, with an incidence of up to 20%. Symptoms include shoot blight with scorching of leaves, branch wilt, decline and death of trees. 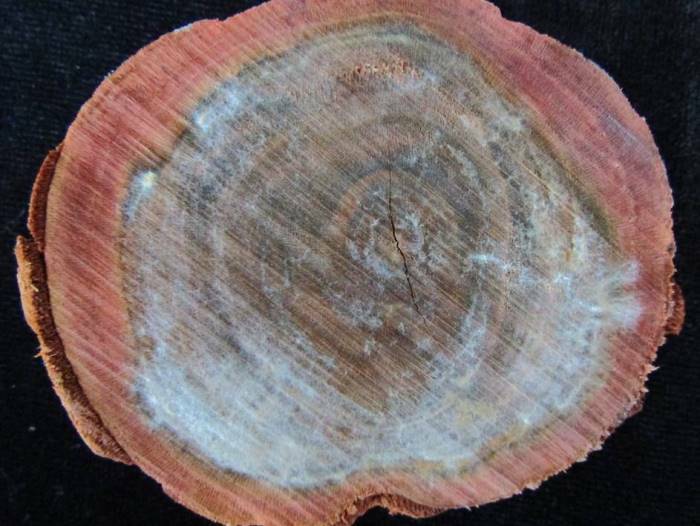 Cross-sections of the branches of infected trees showed necrosis and brown vascular discoloration of the wood (Fig. 1). Necrotic wood was surface disinfected (1% NaCl for two minutes, 75% ethanol for 30 seconds) and small pieces (4 to 5 mm) of necrotic tissues were surface sterilised for one minute in 1.5% NaCl, washed twice with sterile distilled water, and plated onto oatmeal agar (OMA) and incubated at 25°C. After seven days, the surface of necrotic wood was colonised by a white mycelium (Fig. 2). A pure culture was obtained by single spore isolation. 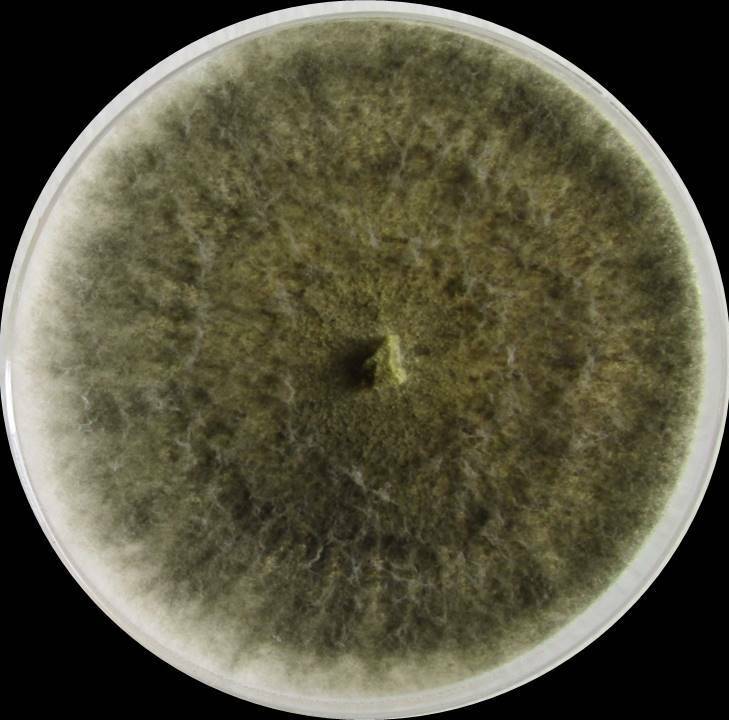 The fungus obtained was initially white with dense and hairy aerial mycelium that gradually turned dark grey to olive green (Fig. 3). The arthroconidia were dark brown, thick-walled, and one-celled, 6.3 to 14.2 × 2 to 4.5 μm, and ovate to rectangular. Based on morphological characteristics, all isolates were identified tentatively as Neoscytalidium-like species (Phillips et al., 2013). The identity of the isolated fungus was confirmed by PCR amplification of the internal transcribed spacer (ITS) region using the ITS1/ITS4 primers (White et al., 1990). Based on a BLASTn search, the isolate showed 99% sequence identity with an isolate of N. dimidiatum that caused shoot blight, canker, and gummosis on almond (GenBank Accession No. MG021578). DNA sequences were deposited in GenBank (MH676062). Pathogenicity tests were conducted with mycelial plugs of isolate MRHf1 on one- to two-year-old branches of plum plants cv. Black Star. Ten branches were wounded between two nodes using a sterilised scalpel. Mycelial plugs from the margins of actively growing colonies were placed in the wounds and wrapped with paraffin film. Non-colonised OMA plugs were used as controls. 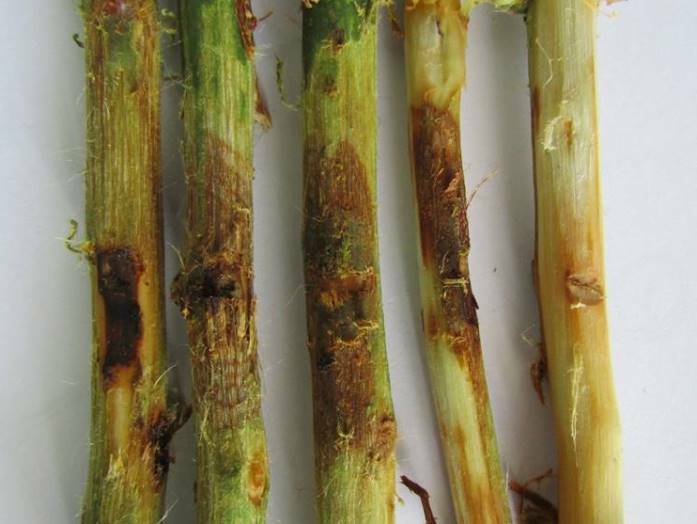 Inoculated and control plants were maintained in the greenhouse at 25°C and high humidity for 20 days, after which the bark was peeled off and lesions were observed upward and downward from the inoculation point. All inoculated branches showed necrotic lesions (Fig. 4). No symptoms were observed in the control branches. The pathogen was re-isolated from all inoculated branches and identified by conidial morphology, fulfilling Koch's postulates. Neoscytalidium dimidiatum has been reported from a diversity of woody plants around the world causing canker and gummosis on citrus in Italy (Polizzi et al., 2009) and canker, shoot blight, and fruit rot on almond in California (Nouri et al., 2018). To our knowledge, this is the first report of N. dimidiatum causing plum dieback and decline in Tunisia. Figure 1: Branch of plum cv. Black Star showing necrosis in the centre of the wood. Figure 2: Surface of necrotic wood colonised by white mycelium. Figure 3: Hairy, dark grey to olive green colony of Neoscytalidium dimidiatum on oatmeal agar at 25°C. Figure 4: Pathogenicity test performed on shoots of plum cv. Black Star showing necrotic lesions which developed after 20 days at 25°C.